1) Why did the window box? 2) Why did the projector blush? 3) Why are goldfish gold? 4) What kind of fish is famous? 1) Because it saw the garden fence. 2) Because it saw the film strip. 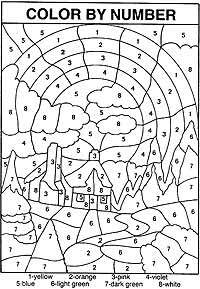 3) So that they don’t go rusty. The international dance competition, the 2004 Theatrical Festival, hosted by the Commonwealth Society of Teachers of Dancing (CSTD), was held in Perth, Western Australia, in July. 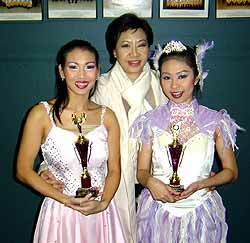 Sarassanan and Nootchanart both aged 24, have been ballet and jazz students with ML Preeyapun Sridhavat (centre) since 1987. They are now ballet and jazz teachers themselves at the Chiang Mai Ballet Academy. It annual competition has been running for 25 years, and is very popular with all dancers in the Asia-Pacific region. 3,500 participants took part, mainly from Perth, but also from the UK, the USA, China, Mongolia, the Philippines, Indonesia, Singapore, Malaysia and Thailand. Two dancers from Chiang Mai Ballet Academy competed. Sarassanan Chantharabart won the first prize in the Modern Ballet category and she also gained second prize in Jazz dance. Nootchanart Saiudom took second prize in the Modern Ballet category as well as winning an Honorable Mention in Jazz dance. These results give our dancers international as well as adding more trophies to their collections. The trip was funded by the Commonwealth Society of Teachers of Dancing (CSTD), Australia in conjunction with the Chiang Mai Ballet Academy. Chaperone Betty Tilley, the C.S.T.D. Asia Pacific Regional Director, and ML Preeyapun Sridhavat, Director of the Chiang Mai Ballet Academy went with them. It was very inspiring for the Chiang Mai Ballet dancers to see the high levels of excellence shown by the students in Perth. Children learn acrobatics at a very young age, and all dancers seem to manage difficult steps and high kicks with the greatest of ease. In Thailand one might find one or two dancers in a whole school with this level of expertise, yet in Perth you see groups of 20 dancers able to dance to this level. It was mesmerizing! The results gained by the two Chiang Mai dancers are even more outstanding when looked at against such stiff competition. IC-ACE (International Center, CMU) recently hosted the Northern Regional version of the 19th General Orientation Sessions for US Education. The Bangkok-based organizers (the US Embassy, IIE, Bangkok Bank, and Office of Civil Service Commission) were actively involved helping to run the various briefings and workshops at CMU’s International Center. Consul General Eric Rubin takes time to visit with the participants. IC-ACE also welcomed deans and directors from Santa Monica College (Los Angeles) and the International MBA Program, Baldwin-Wallace College (Ohio), who shared their experience in workshops and interviews. In total, around 500 visitors to the event heard presentations by 50 distinguished speakers, US Alumni and AUA on key features of US Education, Global English, BrainFlex Plus!, TOEFL ITP, GRE and GMAT. Officers from the US consulate general conducted a popular workshop on US student visas and a pre-departure briefing. During Go USA 2004! 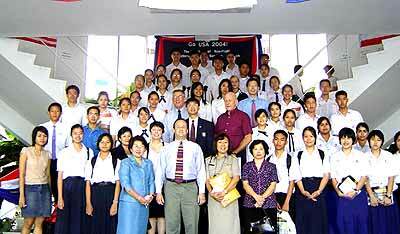 the best Chiang Mai and Lampang high schools competed in the qualifying round of the US Consul General’s Challenge Trophy 2004. US Consul General Rubin took pleasure in presenting prizes to the winning teams: Lampang Kanlayanee, Yupparaj Wittayalai, and Prince Royal’s College. Looks like it will be exciting when Prince Royal’s College defends their championship status during the BrainFlex Plus! Olympiad scheduled for late November. Through the Etouzaidan Foundation, Japanese families have donated scholarships to 315 students in Chiang Mai, as well as others to Mae Hong Son and Mae Wang students. 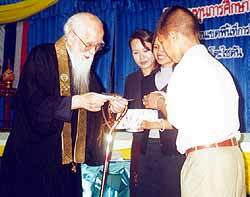 Scholarships were also given to 107 students in Mae Hong Son and 50 students in Mae Wang district’s Ban Kad. Shirabe Kanga, left, chairperson of the Etozaidan Foundation, presents a scholarship to a student. The ceremony, hosted by the Regional Office of Education, Area 4, took place at the 700 Year Anniversary Stadium Hotel on July 21. Katsuhiro Shinohara, Japanese Consul General, encouraged the students to continue doing their best in their studies. The Japanese families believe that education is a significant component in the country’s development. The NPO Etou Foundation in Japan collects money from families while the Etouzaiden Foundation, Chiang Mai acts as the intermediary in Thailand to place the scholarships. (From right) Katsuhiro Shinohara, Japanese consul general; Shirabe Kanga, chairperson of the Etozaidan Foundation; Saitou Reishi, its deputy chairperson; and Fuji Shucho of the foundation’s committee with some of Japanese family members who have given scholarships to Thai students. Each scholarship is for six years and each family in Japan ‘adopts’ one Thai student during this time. The foundation selected those students who do well at school and come from poor families. According to the foundation, students in secondary level will receive 2,000 baht a year while high school students get 3,000 baht a year from their Japanese ‘families’. Funding for college students is given based on the judgment of the supporting families. The foundation has been running this project for eight years and increasing numbers of families in Japan are showing interest in giving financial support to Thai students, as can be seen from the fact that this year’s number of scholarships rose by 70. Watha Minsen, a Chiang Mai University lecturer from the Statistics Department in the Faculty of Science; Chayanont Minsen, a graduate student of Mahanakorn University of Technology in Bangkok; and Supattra Noiboonlue, a lecturer at Rajapark College have won the first runner-up award in the 2nd Thailand Embedded System Contest organized by the National Electronics and Computer Technology Center at the professional level in the freestyle category. Their project is the Smart Vehicle Actuated Thailand (SVAT). SVAT is a traffic system control which was formulated under the supervision of advisor Asst Dr Jitkasem Ngamnil. Watha said that the SVAT was created following their understanding of traffic jam problems, which have been getting worse even in many regional cities. They believe that one of the causes is an ineffective traffic light system. SVAT uses a fully actuated control which can automatically observe presence of cars on each side of the street, and change the traffic light sequence accordingly. It consists of three main components with an inductive loop detector, micro controller and traffic light controllers. SVAT is also unique since there is no set time before traffic lights change, so drivers do not have to wait long to move if there are no cars on the other side of the street. When an experimental trial of the system was carried out, it was found that SVAT increased the efficiency of traffic light changes by 45 percent.